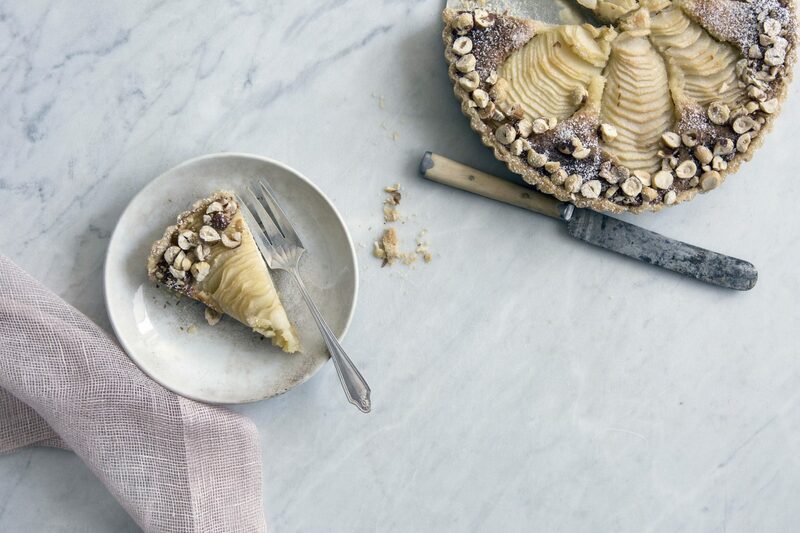 MAKES 1 (9-INCH) TART Whether you know her by her name or her gorgeous, delicious gluten-free culinary blog, Cannelle et Vanille, Aran Goyoaga is worth exploring and following, as evidenced by this wildly delicious, stunning tart. Suitable for company, gifting, or hoarding and wonderfully gluten-free, it tastes as good as it looks. Make the Gluten Free Pie Dough: Place the first five ingredients in the food processor and pulse a couple of times to combine. Add the cold, diced butter and pulse 10 times until the butter is cut into the flours. Add the ice water while pulsing. You might not need all of it so reserve a couple of tablespoonfuls until mixed. The dough should stick together when pressed but not be too wet. Form the dough into a disk, wrap it in plastic wrap, and flatten it a bit with your hand. Refrigerate the dough for 1 hour. Roll out the dough to about 1/4 to to 1/8-inch thickness and fill the tart mold with it. If the dough cracks, don’t worry, just pinch it back together. It might happen if it’s too cold. Return the tart mold to the refrigerator for another 20 minutes while preparing the filling. Make the filling: Preheat oven to 375F (190C). Mix the first six ingredients in the food processor and pulse until it is a smooth mixture. Spread the frangipane filling over the cooled tart dough. Place the pear slices over the frangipane creating clusters and lightly pressing down. Place the tart on a baking sheet (some of the butter might melt out of the mold and so it doesn’t drip down). Bake in middle rack for about 40 to 45 minutes until the top is golden brown. Let the tart cool slightly before un-molding. Top the edge with chopped hazelnuts and dust with powdered sugar. Despite going to business school and receiving her M.B.A., Basque-born-and-raised Aran Goyoaga was compelled to switch gears and attend culinary school. Thank goodness. 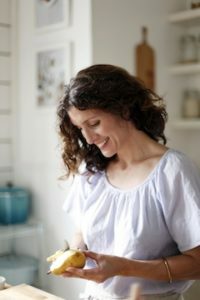 Now the self-taught photographer, stylist, and author of the GF cookbook, Small Plates & Sweet Treats teaches classes and workshops in both and regularly regales us all with gorgeous, delicious seasonal gluten-free recipes on her culinary blog, Cannelle et Vanille. The fact that it’s been nominated for two James Beard awards for Best Personal Blog is icing on the GF cake. Want more tasty recipes from Aran and our other favorite GF leaders? Order a subscription to GFF today, just in time for our winter/GF Power Chicks special issue!